Norwood Russell Hanson was a seminal figure in post-war philosophy and history of science. His major works, "Patterns of Discovery" and "The Concept of the Positron", are landmarks in conceptual analysis and the historical case-study approach in the philosophy of science. This book provides the first comprehensive and exclusive treatment of Hanson's philosophy. In addition to providing an extended biographical treatment of this larger-than-life thinker, author Matthew D. Lund presents a nuanced and historical approach to Hanson's central philosophical concerns. These include the relation of theory and observation, normative and descriptive analysis, scientific objectivity, the logic of discovery, and the conceptual development of quantum theory. 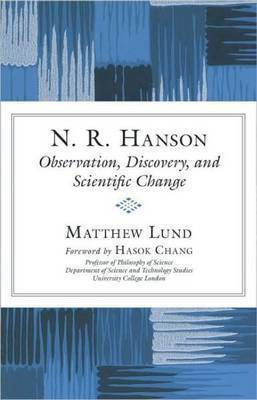 Lund also examines Hanson's work in the history of science and his attempts to integrate history and philosophy of science. Finally, this book demonstrates that Hanson's epistemic framework couples nicely with contemporary cognitive scientific accounts of analogy, conceptual structure, and problem solving to provide an accurate and fruitful account of the epistemology of science. Matthew D. Lund (Glassboro, NJ) is an assistant professor in the Department of Philosophy and Religion Studies at Rowan University.